The integrated gas fireplace insert, available models and 90P cm peninsula 130P. It creates an atmosphere with a vision long flame, such as a widescreen movie format. 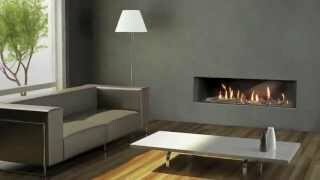 Integrated insert Gas fireplaces, avaible 90 cm and 130 cm models with 3 faces. It creates an atmosphere with a vision long flame, such as a widescreen movie format. Visible flame surface for the model. 90P installation of the peninsula - L 836 mm H x 320 mm. Visible flame surface for the model. 130P installation of the peninsula - L 1369 x H 320 mm. Flue balanced, sealed chamber, Running by LPG and natural gas. Housing to redirect the standard equipped with heating flows.